Moving with your cat can be extremely stressful. But once they settle in, there is nothing more rewarding than watching them look at their new world! Moving with any pet can be a hard experience. From wrestling them into a carrier to traveling with them to your new home, this process can be as traumatizing to your pet as it is to you. If you are planning a move to Harborside Village Apartments, we have some tips on how to move with your cat as well as settle them into their new home. Let’s get started! Before moving, start introducing your feline friend to their carrier. Leave the carrier out in the open for them to investigate and get used to. To entice their interest, put some food into the carrier. Put out your boxes at least a week before you should start packing so your cat has time to get used to the boxes. Do not change your cat’s routine before moving day. Keep their schedules the same with feeding and play time. Also speak with your pet about some anti-anxiety medicine to help make the moving process easier with nervous or skittish cats. On the day of the move, make sure to tell your movers about your cat. Keep your pet in a bathroom with food, water, and litter box in order to keep them safe while moving items into the moving van. During the move, do not open the carrier as your cat could try to run away and could be hurt. To help settle them in, wait until all the big furniture has been moved into your apartment and let it out of its carrier in a relatively quiet room like your bedroom. This will help it settle down after the trip. Before opening the carrier door, set up the cat’s food and water dishes as well as its litter box. Place treats around the room to encourage exploration. Although you should keep the door of your room open, don’t force it into other rooms of the apartment until it is ready to explore new territory. 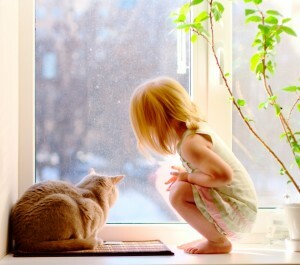 Spend time with your feline friend to help it adjust to its new surroundings. Think about perches for your cat. If you cat loved to look down on the world, keep high furniture free of clutter and things that could be knocked off like books and knickknacks. Let your cat enjoy the windows in your new luxury apartment by keeping window sills clear of dangerous plants and by putting up a simple cat perch that doesn’t need to be drilled into the wall to hold up your cat. This will let them look outside the windows and enjoy the sights. Scratching posts are not only “scent soakers” but can help your cat clean and sharpen their claws. Place at least one in the apartment to keep your cat from clawing your furniture and carpeting. These tips will help make your cat feel more comfortable in their surroundings and be able to adjust sooner. Remember that cats do not like change and should not be forced into an environment until they are properly prepared. This entry was posted on Tuesday, August 18th, 2015	at 8:21 pm	. Both comments and pings are currently closed.